After a series of albums with W.I.N.D, Jimi Barbiani has stepped out on his own and gives us his second solo album Blue Slide. Jimi’s band consists of Daniele Vicario (Bass) and Gianluca Zavan (Drums) and while a whole host of different vocalists contribute to the CD, Jimi’s proficient slide guitar skills do the communication for him. Slide guitar is really unique to the blues. Having been made popular very early on in blues music by the likes of the Blind Willes Johnson and McTell, Son House and even the great Robert Johnson. From there many rock bands adopted it over the years notably by Duane Allman and even in the modern day by Jack White. 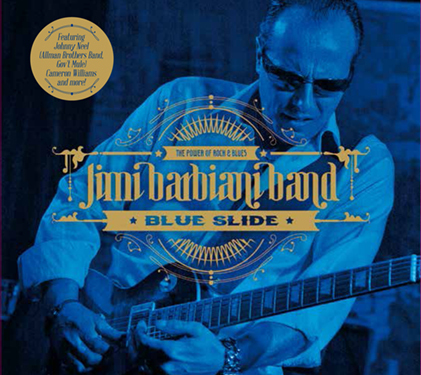 Even listeners who claim not to be a fan of slide guitar should pick up Jimi Barbiani’s Blue Slide. It is an impressive album featuring some tremendous slide guitar playing that rocks with a blues influence. Take a moment and watch the video below for live version of “Ten O’Clock Train” that’s from a forth coming Grooveyard Live CD/DVD. Book Jimi Barbiani Band @ bluesfarm !